Congratulations to Dr. Linda Regan, who was awarded EMRA’s prestigious Program Director of the Year award at SAEM 2016. She is the first woman to receive the award! 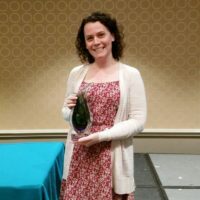 Her award was presented by two of her former chief residents, who noted that she “universally… inspires her residents to be kinder, smarter, and better physicians to meet her high bar and to earn her trust and respect.” In a letter of nomination, her residents describe Dr. Regan’s deep and unwavering commitment to her residents and her tremendous clinical acumen. In addition to her stellar clinical skills and her supportive relationships with residents, Dr. Regan has published widely on medical education and contributed on the national level as a member of the board of directors of CORD and as an ABEM oral board examiner. She has won multiple teaching awards and is renowned for her engaging lecture style and keen ability to distill and deliver feedback to residents. She is beloved by her residents. Congratulation, Dr. Regan, on this well-deserved honor!